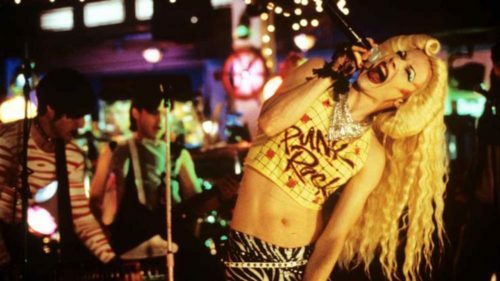 In 2012, John Cameron Mitchell announced that he was writing a sequel to Hedwig and the Angry Inch, the beloved rock musical and film about a transgender East German rock star coming to terms with the romantic betrayals she’s faced. In a recent interview with Boston radio station WBUR, Mitchell revealed that he has dropped the idea of doing a straightforward sequel and has instead decided to create a podcast series called Anthem. Its story will follow Ceann Mackay, a person who lives in Hedwig’s old trailer (the one where she first put on a wig and became herself). Mackay will consider his life and mortality as he holds an on-the-air radio telethon to raise money to get a tumor surgically removed. It make sense that Mitchell would feel this way seeing as the stage musical turned into a modern cult classic with its 2001 film adaptation. The musical eventually hit Broadway in 2014 and won four Tony Awards, snagging several big name actors to play its titular role, including Neil Patrick Harris, Taye Diggs, Andrew Rannells, Michael C. Hall and Darren Criss. It has since been performed and toured internationally. The podcast series, which is expected to debut this May, will feature 30 original songs and a star-studded cast including Glenn Close, Patti Lupone, Cynthia Erivo, Denis O’Hare, Laurie Anderson, Marion Cotillard and Justin Vivian Bond. I sort of see it like Olive Kitteridge, like a long miniseries, four to six hours. It’s still a musical; it’s very much about her. It’s kind of on indefinite hold now because of other projects, but it’s been developed a good deal. It’s darker. It’s about the second half of her life, which is the antithesis of “It Gets Better” videos—for her, it gets worse. My favorite playwright is probably Samuel Beckett and; he was always laughing at the abyss. When Hedwig returns, it will definitely be about the limitation of life and how absurd that is. The Anthem podcast series is expected to have more than one season, according to Hornet. The first season is entitled Homunculus and will feature ten 30-minute episodes, co-directed by Mitchell and Bryan Weller. Mitchell has said the the podcast is inspired by real life as he’s raising money to assist with his mother’s Alzheimer’s care.